Practice these methods on coins still in circulation before using them on collectible coins. This will allow you to see the results of the methods and decide whether to use them on your collectible coins. Give all coins a preliminary cleaning in soapy water; using a dish soap works well. Scrub them with a toothbrush to remove any loose dirt. Rinse and dry the coins with a rag, and re-examine them. If much of the surface dirt has been lifted away, simply store the coins in that condition. Remove difficult surface dirt by scraping it with a sharpened wood stick with mineral oil on the tip. The stick will lift the dirt up, allowing you to wipe it away with a clean cloth. Rinse the coin and store it. Clean silver coins by letting them soak in an ammonia bath for up to three days. The ammonia will remove dirt and brown, black or gray toning. After most of the overall toning has disappeared from the coin, remove it from the ammonia and wash it in soapy water. Next, soak the coin in lemon juice to remove touch stains. Leave the coin in the solution for 15 minute intervals, rinsing and examining for pitting between lemon juice baths. A few stubborn stains around figures or engraving may remain, but do not leave the coin in long enough to pit the surface. If desired, finish restoring the coin by cleaning it with a commercial tarnish remover. You can dilute the tarnish remover with mineral oil if desired. Rinse and dry the coin, polish it and store. 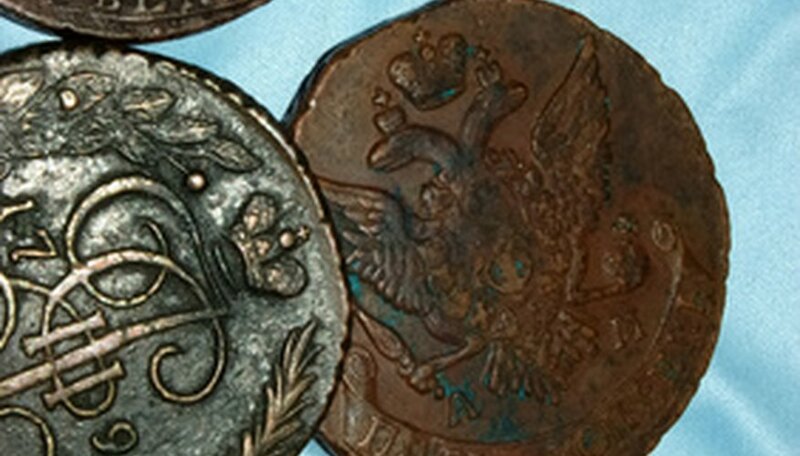 Clean copper coins that have an encrustation or patina by soaking them in an ammonia bath for up to three days. When most of the surface staining has been removed, remove the coin from the bath and wash it in soapy water. Do not use this method on copper coins that have no surface encrustation. Polish the coins with mineral oil and let them sit in sunlight for several days. Wipe clean and store. Clean nickels by dunking them in an ammonia bath, cleaning them with soapy water, dunking them in lemon juice and then rinsing clean. Do not allow the coins to remain in either bath, as this will cause pitting. Polish with mineral oil and store. Test the cleaning chemicals on a tiny surface of the coin using a cotton swap or even a toothpick dipped in the chemicals. This will demonstrate the effect of the chemical on the coin's surface. If you are concerned about the value of your coins, consult an expert before cleaning them. A professional may recommend a restoration method or simply leaving the coins in their existing condition.